I have to say that I am a huge sucker for Christmas lines. Mainly because I am one of those insane people who make the 80 plus Christmas cards that they send out every year. I know. Every year I am tempted to throw the family picture on some digital template, have them mass printed and be done with it. Then that whole insanity creeps back and I end up making them. With that being said, one company that never fails with their Christmas line for me is Basic Grey. I mean seriously!! They have tight patterns, great colors and wonderful embellishments. Over the next few review days, I will be sharing this wonderful line with you. There will be prizes to be won as well. WOO HOO! So let's begin! 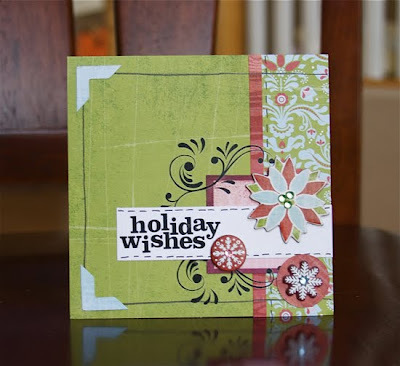 Today I will show you the fabulous Greeting Card Kit. This kit is absolutely FANTASTIC! It comes with 8 cards cut and pre-scored, 8 envelopes too(to me this is HUGE!!! ), chipboard, rub ons, and die cuts. Each die cut and chipboard has a number that coincides with the card number. Say you are making the card number one, you just go and punch out all the dies and chipboard that say the number one. GENIUS! Makes it all too easy for you! It includes step by step instructions that basically hold your had through the whole process. Now there are a few tips that I would recommend. #1. When cutting out your die cuts use a glass mat and craft knife. My glass mat is a piece of glass out of a $1 frame. To cut out the die cuts, follow the pre-cut lines with your knife. It will make it easier to come out and there aren't any notches on the sides that you usually have to go back and cut off with your scissors. #2. Add your own adhesive to the chipboard along with the already adhesive on the back. You really want it to stick and that way it will. 1. Loved the "no way you can mess this up" easiness. 2. Absolutely love that they included envelopes!! 1. The not-so-very strong adhesive on the chipboard. But hey, otherwise this kit ROCKS! What Do You Think? Does this kit make you want to rub noses with your kids and loved ones? What do you like the best about what you've seen? Leave a comment by midnight EST tonight to be entered to win your own Eskimo Kisses Greeting Card Kit! WOO HOO!! I used the BG Halloween card kit, and the cards turned out great. Be patient with the really small piece while punching/cutting them out, and you will have an awesome set of cards. Today is Friday the 13th, but hopefully everyone will have fantastic luck today! Oh, I'm another one who loves the Christmas lines...and this one is just darling! Love those cards! What I like best is this looks like something I could do! I have a terrible time making cards and this looks like a shoo in for me. I have used BG card kits before and just loved them. Thanks for the chance to win! I love this line! I bought almost all of it, but did not get the card kit. Very cute! I am so totally into making cards right now; however I am not adventurous enough to make 80 Xmas cards like you. So if I win this awesome blog candy I may make just 8 cards to give to my family who lives out of town. I really love BG's lines. I've never tried their card kits, but it sure does look awesome. I like that there's a pattern to follow, so that your card is the most beautiful that it can be. 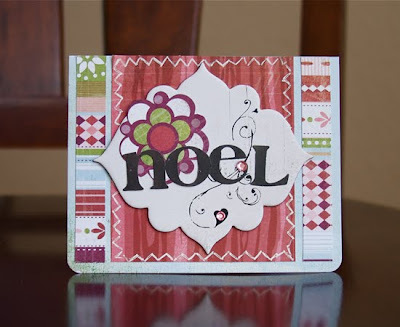 I have made a few of these BG card kits and love them. They really are so easy to make and turn out so nice! 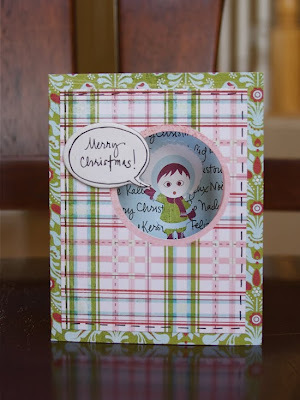 I love this kit - I really want to use it for all of my Christmas cards this year because it's just so darn cute! I love all of Basic Grey. It is my favorite line and their card kits are great! I love how easy they are to put together! And I love the smell when you open a paper pack or card kit! Fresh Paper! I love it! I'm a sucker for christmas lines and basic grey. I can never have too much. I love finding alternate uses for holiday lines , too. Thanks for the review. Totally agree with this review ... the cards are cute, the kits are great. But all of the die cut pieces have notches that are VERY annoying, and the chipboard has to be glued by hand, it's just not strong enough. Love how I can add or change the cards with other products from the same line. I've seen this line in my LSS and it's adorable. I love the colors - fresh for Christmas! Thanks for the chance to win! Ooh - I love the colors in this card kit. and I love Basic Grey. I haven't used a card kit before, this looks fun and easy! I think this BG line is just darn cute! I love their card kits! I love the colors and the cute designs in the papers. But then, I have always been a BG fan. I've thought many times about making cards...these would make it really easy to get started. Great cards and such adorable papers!! Thansk for a chance to win some great products!! 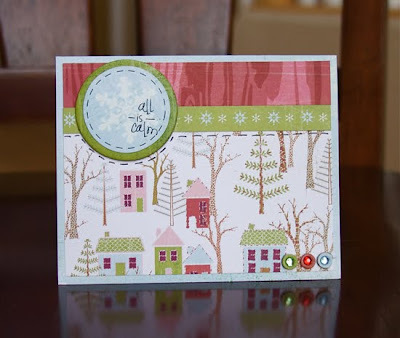 I love the softer colors and the cute design of this Christmas line. You made me think that I might actually be able to make these cards and have them come out looking okay!! I tried making my own design for cards and something always seemed to be missing. So this summer I bought one of the BG card kits. I was so impressed. They are beautiful and easy to make. I love adding glitter and bling to them. I just finished making the fall kit. Great idea about cutting the pieces out on glass! Thanks for the tip. Would love the Xmas card kit!!! I love this kit. I am new to card making and this will make it so much easier for me! I love the idea of a BG card kit. This way your cards are homemade but you dont have to stress about how to design them. I love everything Basic Grey. Thanks for sharing your beautiful cards. 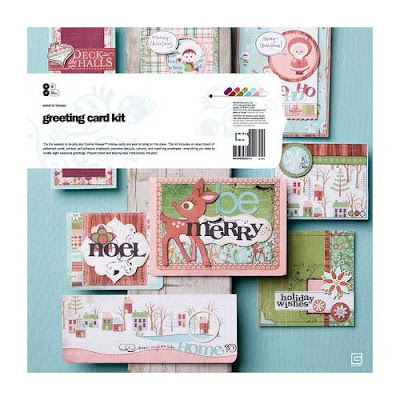 This card kit is so cute...love the little eskimos! I too struggle with making my own Christmas cards...the first 15 are fun, the rest a chore. This would definitely make it easier! That's adorable, and I really need to get started on my holiday cards! Thanks for the chance to win. I think the Eskimo Kisses line is adorable & the cards look so cute & easy!!! The Eskimo kisses line is adorable. I am not creative at making my own cards so I like that most of the work is done for you! The line is totally adorable. Love verything about it. Those Eskimos are too cute. Thanks for the chance to win. I did not know this line came as a card kit. How fabulous! Those cards are so cute. This is such a great line!! What an awesome kit with everything being number coded. The cards are so pretty. Thanks for the chance to win. THose cards are adorable... I love how soft everything looks. i love the colors! i have used the bg kits before and i love them. OMG! I Looove Basic Grey. These cards are so cute. 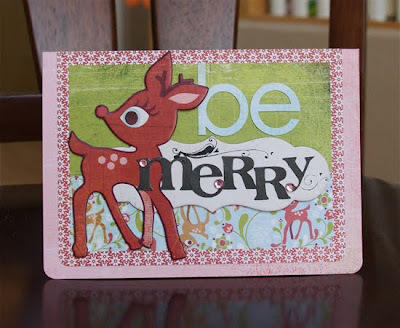 I have to agree, I always add a little bling to my cards:) Thanks for the friendly reminder that I need to get going and make my christams cards. This pack would certainly take all the hassle of getting out so many cards:) Thanks for the inspiration. Off to find out if my local stores here in New Zealand have them in yet:) LOL. Thanks for an awesome review AS USUAL!!!!!!! Looks like a great card kit. Anything that makes making the holiday cards easier is for me. Thanks for a chance to win. Love these cards and the kit looks great!!! 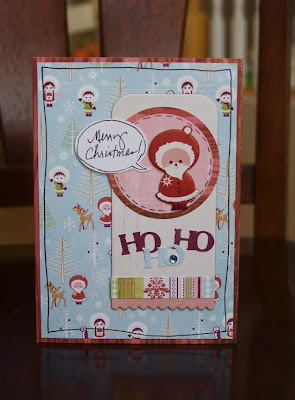 I love card kits that are fast and easy but cute as well. This one really speaks to me! Super cute papers and embellishments=super cute cards! I've been eyeing this kit for a while...hope I win it! LOVE Basic Grey and the Eskimo Kisses papers are lovely--especially the one with the houses on it! I have loved every BG card kit I've made. This one looks great too! Their embellishments are so cute! Oh, I love those! Some card kits are so cookie cutter and these are all different. Love that! I love your cards! They are too cute. I have your Christmas paper problem too. I don't take as many pictures of Christmas now that my kids are older, but still have a problem with buying the newest line from Basic Grey! I confess I haven't begun thinking of Christmas cards yet, so this kit would be a godsend! Your cards are just adorable! I am all for kits and BG is the best. Thanks for sharing. What's not to like???? Love the papers! Love the cards you created! Gorgeous! Fun! Thanks for the tip re the diecuts. I love the Eskimo Kisses line. I did not realize they had a card kit. Very, Very Cute!!! I am one of those crazy gals that makes all of our Christmas cards to send out each year. At the end, it is all worth it!!! Such a cute kit! Don't know that I would use it specifically for holiday cards, as I rid myself of the guilt of not doing handmade Christmas cards by designing my own digitally and then having them printed. That way I still feel like I've been creative, but I haven't driven myself crazy making 80 cards! I love BG card kits. I bought the Lemonaid set recently and had fun putting them all together. This kit seems awesome! So easy and really pretty! What's not to like about Eskimo Kisses? Love the colors, patterns and the cute chipboard shapes! Love the colors and the little village paper. I am going to do my own cards this year, so I would love these. This is a great looking kit! I love most of the lines that BG comes out with and this is no exception. Fun times! Love those papers - you did such a great job on your projects. I thought I was the only nut who made about 80 cards each year...of course I have not even started this year! these would be a great start! I love BG! It is the best! I like their card kits, it makes things so much easier! The cards are really cute! I tend to like to make really personalized cards and usually make a different card for everyone. So because these cards are a kit that tons of people would have and wouldn't be super personalized, they wouldn't go to the most important people on my list (or my scrapbooking friends) but by the time I am finishing up, having everything ready to go with instructions would be quite the relief, and the people receiving them would feel like I went to so much trouble since they're so cute! I love the colors the best and it looks like they have some great embellishments to go with this line. Can't wait to see it in person. Wow! That is one of the most beautiful winter lines I have ever seen! Love it! Oh, love this line - I'm totally inspired to make cards with this and integrate my holiday photo! ashley, you saved the best for last. love all of these cards and plan to lift a couple. thanks for the great inspo. These are great!! I love the mix of embellishments they have and the pink is wonderful! !